Almost two years into our life in Panama, we’re still discovering new things about our chosen home. This year we’re making an effort to branch out and explore areas we keep hearing about, but haven’t had a chance to visit yet. A few weeks ago we got to tick another one off our Panama bucket list when we visited the Azuero Peninsula – the big land mass that sticks down into the Pacific west of Panama City. The Azuero is the true the heartland of Panama, a vast agricultural district where the pace of life moves a little slower, at least when people aren’t partying. 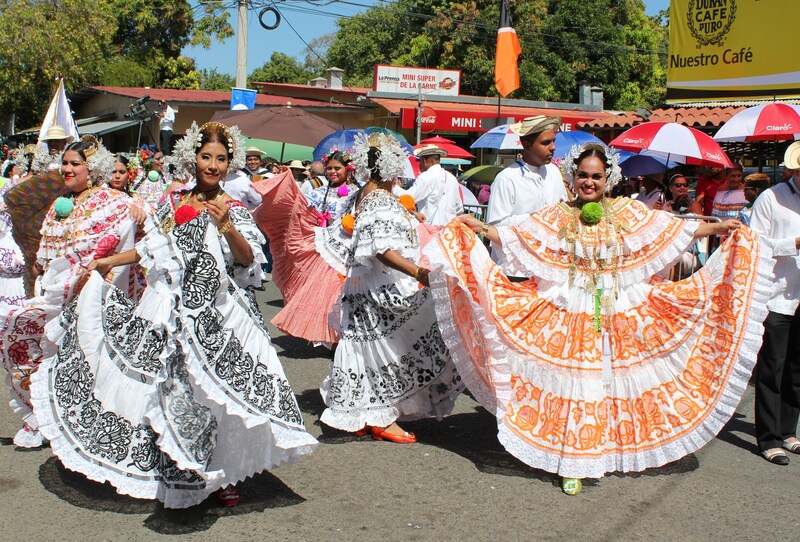 Las Tablas is one of the biggest towns in the eastern Azuero, playing host to one festival after another throughout the year – the two biggest being Carnival (one of Panama’s largest) and the wonderous Desifile de las Mil Polleras (Parade of a Thousand Polleras). Volcán Barú: Another tick off the bucket list! I’ve been captivated by Volcán Barú since the first time I laid eyes on her on our first trip to Boquete in 2010. Even then, the idea to climb Barú someday got stuck in my brain and she landed on our bucket list. Finally last weekend, after almost two years of living here, I got my wish. (John wisely took a pass on this one because, to paraphrase him, he’s saving his knees for Machu Picchu!) The “road” to the top is mostly a horrible, rutted, and rocky dirt track that can only be managed by extremely tough, high-clearance 4WD vehicles with huge tires. It took us about 7.5 hours to hike the 9.2 miles with a total elevation gain of 5,500 feet. I can honestly say the hike was one of the most physically challenging things I’ve ever done, and also one of the most rewarding. Heavens to Murgatroyd – where did November go? And December, for that matter. With 2017 staring us in the face, it’s a good time to look back on some of our best moments this year. So many of those moments have been about spending time with friends and our fur kids in the cloud forest paradise known as the western Panama highlands. Every time we get out, it’s like re-discovering our wonderful home all over again. At the Yandup Lodge in Playón Chico, San Blas Islands last weekend, we tossed a deep question to Blanco, the manager-on-duty and host extraordinaire. What were the traditional spiritual beliefs of his people, the Kunas? He explained that they worship two deities: a mother god and a father god. No church attendance needed; people’s ability to “go up” to the mother and father gods is based on their good works and generosity in this life – a kind of Kuna karma. If you catch a lot of fish and share them with the village, that’s good. If you keep all the fish for yourself, that’s not so good. I like it. I was planning a blog post about our fun night at El Oasis and the pollera exhibition, and my good friend and fellow blogger Kris beat me to it! She did a great job of capturing the magic of pollera. Enjoy! Exactly two weeks from today, we’re hopping that red-eye flight to our new life in Panama. We just know you’re on the edge of your seats, wondering what we’re up to – so here’s a little status report! In typical intuitive doggy fashion, Maggie and Rosie know something big is afoot – although I don’t think they have a clue how much their lives are about to be turned upside down. We’ve gotten them re-acclimated to their crates, which wasn’t too difficult since they were crate-trained as puppies. Funny story: the other day a visitor came to the front door, and when we gave them the “crate” command they both ran into the big crate together! Good thing they’re buddies . . . The other day we took a trip to the Copa Airlines cargo office at LAX and spoke to Jaime the ops manager. Jaime is a very nice and helpful young man who put us completely at ease about the process of getting dogs, crates, and paperwork dropped off prior to our flight. We took one of the crates to show him and got his blessing, and we were pleased to find out we don’t have to replace the connecting hardware or provide labels, ties, etc. (as we had been told before). We just provide water bottles and a little food, and Copa does the rest. It’s clear that they’ve flown many, many animals and know exactly what they’re doing, which is an enormous relief to us.